Dips: Ensures that all skin areas of your dog are treated. May need to be repeated for 3 to 4 weeks. Note that the key to tick removal dog is to make sure that ticks do not attach for 24 hours or more. It is not likely that disease can be transferred in under 24 hours. Use of a Preventic brand collar is a popular way to remove ticks from a dog and then protect your dog from ticks. The collars will kill any ticks that are on your dog and cause them to fall off. If using this approach be sure to vacuum up any ticks, particularly where your dog sleeps. Note that the collar should NOT be used with dogs that are under 3 months of age. The Preventic collar will provide protection for up to 90 days. The active ingredient in the collar is Amitraz, which is highly effective at killing ticks. Diseases prevented include Lyme and other tick borne illnesses such as Rocky Mountain Spotted Fever. After the collar is place on your dog, the Amitraz will move through your canine's skin oil and coat. Be sure to replace the collar if you notice a living tick on your dog as you get close to the end of the 3 month period. The collar will kill ticks within 24 hours. It is possible to combine a collar with other products such as a topical (Frontline, BioSpot), but be sure to consult with a veterinarian, particularly if your dog is young, pregnant or suffering from any medical condition where greater care is needed. Sprays such as Frontline Spray will help protect your dog for a period of up to 2 months. It is usually used when a dog has many ticks that need to be killed immediately. After using consider using a topical such as Frontline Plus or K9 Advantix. In the case of Frontline, the spray uses Fipronil as the active ingredient. The use of dips can be messy. If you decide to use one to ensure that your dog's body is thoroughly treated, do so in the bathtub and make sure that the room is well ventilated as dips have strong fumes. Wear latex gloves to ensure that any bacteria in the removed tick doesn't get on your skin. Prepare a small clear contain for the tick when removed in case it needs to be tested. If the tick is alive, fill the container with rubbing alcohol. Clean the area with the tick with a cotton ball soaked with hydrogen peroxide or rubbing alcohol. 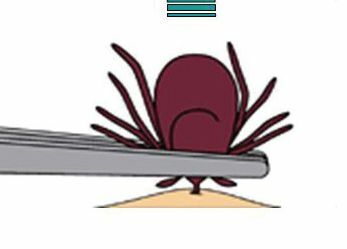 With a tweezers or a tick removal tool such as a Tick Key, grasp the tick at the head/mouth and pull straight from your dog. If using a Tick Key, follow the manufacturers directions. If the head of the tick is deeply embedded, it may remain behind after pulling off the tick. If you can't grasp it with the tweezers, they will fall out naturally. 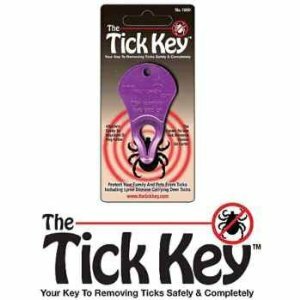 Tick Removal Dog can be managed easily and quickly with a tool such as Tick Key. The device is under $10 and is a must for any dog owner that lives in a region where ticks are common. A bump may form where the tick was removed. This is natural and will go away to 2 to 3 days. After removal, clean the area of skin with the hydrogen peroxide or antibiotic ointment. Tip: Be sure to record the day and time you moved the tick. Also save the tick in the sealed container for several weeks as symptoms could appear weeks after your dog is bitten. In this case your veterinarian will want to know the time of the bite and then possible test the tick. Treatment for tick borne illnesses such as lyme disease and rocky mountain fever is effective with common antibiotics. Symptoms usually look like arthritis such as swollen joints.